A black chalk drawing of the resurrected Christ, rising from his tomb. This drawing depicts the figure of Christ emerging from the tomb, his limbs spanning the entire composition, the relatively small head allowing attention to focus on the magnificently modelled torso at the centre. 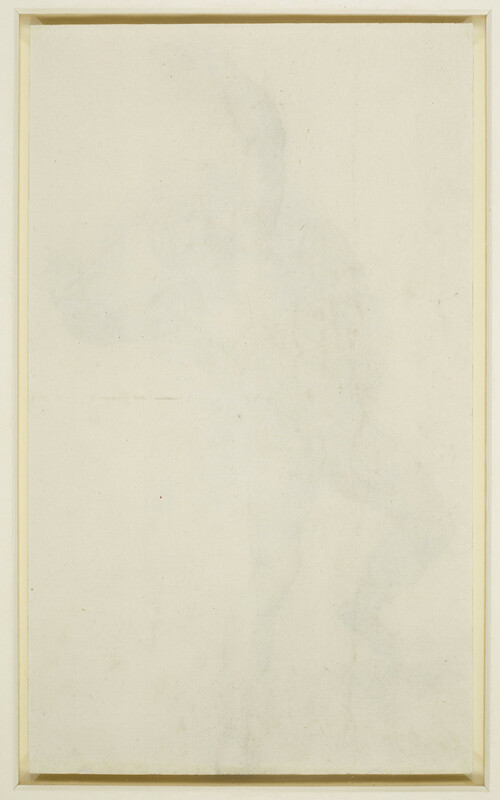 Michelangelo used tiny stippled strokes of chalk to build up the body, which stands out in implied relief from the plane of the paper, emphasised by the flattened, decorative swirl of the shroud. 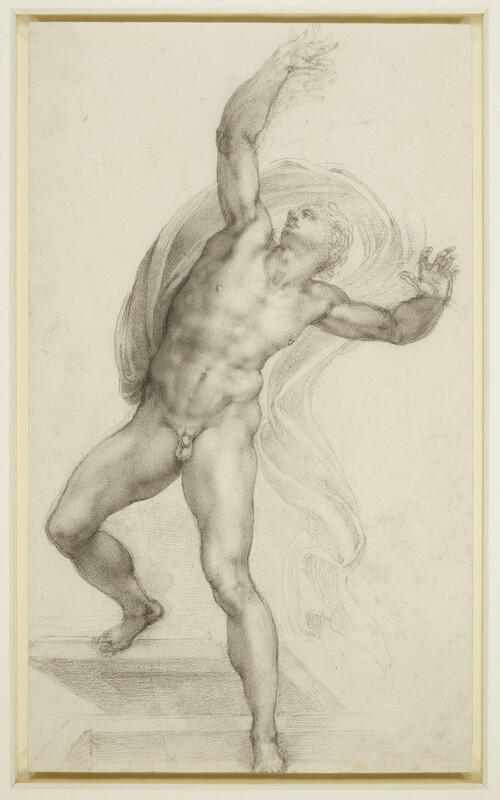 Around 1530, Michelangelo made more than a dozen drawings of the Resurrection or the Risen Christ alone. It has been suggested that the present drawing was a preparatory study for a Resurrection in the altar wall of the Sistine Chapel, which now accommodates the Last Judgement (Tolnay, Corpus 265). However, while other Resurrection studies may have been prompted by a specific project, the care taken over this drawing suggests that it was intended not as a preparatory sketch but as a finished work of art. In no other work by Michelangelo is the Resurrection of Christ expressed with such glorious exuberance. The Saviour is young, virile and beardless, Olympian in form and perfectly muscular. His meticulously modelled torso is composed of tiny strokes of chalk with no blending, as highly finished as any of the mythological sheets of the same period, and the drawing was thus probably executed as a gift rather than a personal meditation. In the absence of any pictorial setting beyond the lightly drawn sarcophagus and discarded winding cloth, Christ appears as an effusion of pure light or pure Spirit. It is perhaps paradoxical that a drawing of the triumph of the soul over death should so strongly emphasise Christ’s body, but his almost polished torso reflects the effulgent light with a glory that transcends materiality. Text adapted from M. Clayton and K. Perov, Bill Viola | Michelangelo: Life, Death, Rebirth, London 2019, no. 25.